"Mildly spiced and slightly sweet chicken that comes out moist and tasty." Preheat an oven to 400 degrees F (200 degrees C). Combine the paprika, parsley, sugar, mustard, salt, and pepper in a small bowl; set aside. Place the chicken pieces in a 9x13 inch baking dish, and coat with the vegetable oil; arrange skin-side up. Sprinkle evenly with the spice mixture. Bake the chicken in the preheated oven until no longer pink at the bone and the juices run clear, about 45 minutes. An instant-read thermometer inserted near the bone should read 165 degrees F (74 degrees C). This is delicious. I used chicken legs. I brushed each with a small amount of oil and then rolled in the spices. So easy and what a kick! This was tasty and different. Next time I will half the amounts because it made a lot of spice mixture. Sweet and savory and made a very moist chicken. Thanks for sharing. 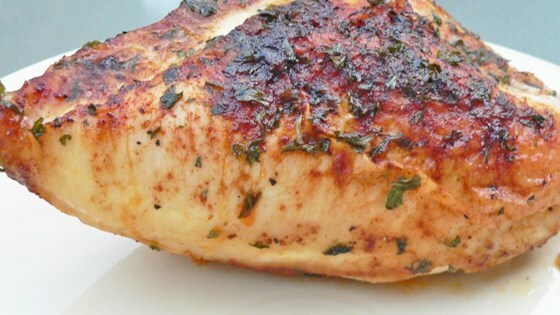 This is an easy and delicious way to cook bone in chicken. I didn't make any changes to the recipe. It turned out so moist and flavorful! My family loved it.